The following is the full text of an interview conducted between CEO of the CSE Richard Carleton and Peter Murray of Kiyoi Communications. For ease of reference, subject headings have been added and can be navigated to using the list of links below. PM: In terms of listing activity, how good a start is the exchange off to in 2015? RC: We are tracking to plan so far, and we had some aggressive forecasts for the full year on our listing side. We are grateful to be hitting those targets because while there has been some improvement, we know it continues to be a challenging funding environment for junior capital in Canada. We are working with regulators and other groups constantly to ensure we provide an attractive environment that lowers the cost of capital and enables strong management teams to move their companies forward. PM: In January, the exchange released new guidance regarding plans of arrangement. This is important, as many CSE issuers listed via plans of arrangement and there are surely more intending to go this route. The guidance essentially states that plans of arrangement remain acceptable but in significantly fewer cases than before. Can you discuss with us the motivation behind this change? RC: We were concerned that as the plan of arrangement emerged as a popular means of taking companies public without having to go through a prospectus process, in a number of cases it was basically being used to create shell companies. They met our listing criteria, but it appeared to us that there was in fact no real business being vended into the company that was created through the plan of arrangement, nor any actual intention for it to be anything other than a shell that would immediately begin looking for a counterpart for a reverse takeover type of transaction. The number being created gave us concern that this was something that really wasn’t in the public interest, and that was what led us to issue the guidance in January. We have also worked very closely with the securities commissions, and particularly those in B.C., Alberta and Ontario, on the concerns we have. PM: What influence do you think these tighter rules surrounding plans of arrangement will have on the pace of applications to list on the CSE? RC: People who have businesses that need capital to grow are going to continue to come to us because of our service proposition. Certainly, for companies with genuine business prospects and for entrepreneurs looking to raise money it is going to have little if any influence on those companies. We will continue to see large numbers of these types of companies approach us and apply for listing. PM: If a company does not qualify for a plan of arrangement then one obvious route to a public listing is to create a prospectus. Can you discuss some of the advantages and disadvantages of using a prospectus to list on the CSE? RC: There are many benefits to taking this approach to the public capital markets, particularly where a company does not have any track record of disclosure. Here, I am thinking of a brand new start-up that has no history of filings, no history of audited financials, really no history of disclosure on any level. In many respects the prospectus model is probably the best way for such a company to turn to the public markets. Another advantage is that once you have cleared the approval process with one of the commissions, the listing process with us becomes very simple. Basically, you can take the disclosure materials that were created for the prospectus and convert that into the listing statement, which is the main disclosure document the company relies upon when they list with us. So there is not really any duplication of effort. Much of the same information goes into putting together a prospectus for the commission to approve as goes into a listing statement. In terms of approaching investors, it can only enhance the confidence an investor would have in a company if the company has been cleared by a securities commission. And another important point, of course, is that a company’s fund raising efforts are no longer limited to accredited investors. With a prospectus, you can market your offering to a much wider range of investors. The disadvantages are the time and expense associated with putting the document together and getting it approved. Now, the corporate finance groups at the securities commissions in Canada are not as busy as they were when small-caps were in their heyday, and feedback from companies that have been through the prospectus process recently is that it is actually fairly quick. So the time component may not be as much of a concern as it once was. On the cost side, I believe the legal community is exceedingly aware of, and sensitive to, the cost concerns that clients have and it is fair to say that they have been helping to address the situation. PM: More than a few thought leaders in the Canadian financial community have spoken recently about so-called zombie companies — issuers that raise small amounts of capital to continue meeting listing requirements but with virtually no financial capacity to further a business and create value for shareholders. How did this situation come about and are zombie issuers a problem on the CSE? RC: The problem came about as a result of the last great boom in mining finance. Probably 4 or 5 years ago, as the price of gold approached its all-time high of around $1,900 per ounce, we created hundreds of junior gold exploration companies in Canada. At the same time we had companies created to pursue opportunities in rare earths, base metals – really, across the board in terms of mineral exploration. All told, 800 to 900 companies were created in a relatively short period of time. All of these companies raised money to go through the first or second phase of an exploration program, and a large percentage of them have spent virtually all of that money. There is a long tradition in Canada that when you have a struggling public company you do everything you can to raise the money to at least pay your lawyers and your auditors, and cover the filing fees. This is done to preserve the potential opportunity for the shareholders, but also to preserve the shell value of the company and in many cases to ensure the company retains title to its mining assets. At the CSE, one of the reasons we don’t have a lot of those companies is because we missed that boom. As a result, our companies tend to be younger and the ones in the mining space are ones that are actively exploring now. And some of our companies that began in mining exploration have elected to find opportunities outside of the mining space. But as far as having a large number of issuers who are in a negative working capital position and barely staying afloat, that is not something we see a lot of on the Canadian Securities Exchange. PM: In February, TD Direct Investing became the latest discount broker to provide its customers with online access to the CSE trading platform. With the addition of TD Direct, virtually all of the leading discount brokers in Canada now provide seamless online access to trading in CSE shares. Which brokers have yet to provide this service to their customers, and are they close to doing so? RC: We just added BMO InvestorLine and they were the last major Canadian bank platform to join the CSE community. At this point the only large discount brokerage that does not have connectivity is Disnat (Desjardins Online Brokerage). We are working with Disnat and one of the platform vendors supporting their service to see what we can do to expedite access for Disnat customers. Otherwise, we have all of the independent Canadian discount brokers and all of the major Canadian bank discount brokers connected to our system. For all intents and purposes, there are no impediments for Canadian investors to trade CSE-listed stocks online. 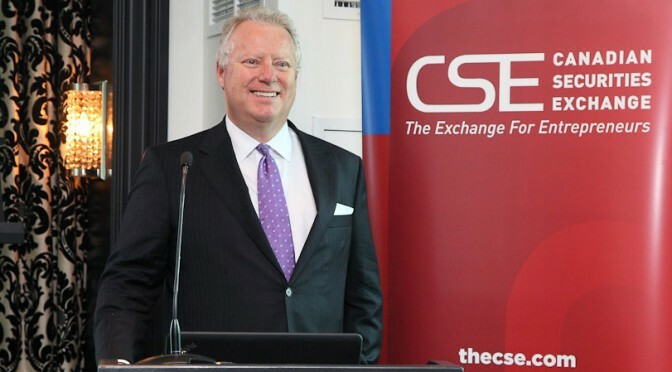 PM: The CSE introduced its own stock price index toward the end of February: the CSE Composite Index. How many companies are in the index and what are the inclusion criteria? Why did the CSE decide that now was the right time to create its own index? RC: We have quite a diverse population of issuers and a number of groups had been asking us to put together a capitalization-weighted index, to see what the performance would have looked like over the last few years and to compare performance with other small-cap indices in North America. There have even been suggestions that at some point, as our organization and the companies included in our index mature and grow, the index could serve as the underlying for financial products such as ETFs or structured products. For a composite index, the general rule of thumb is that you would like to have about 80% of the market capitalization of the exchange represented. As of the most recent rebalancing, our index contains 65 companies that represent close to 80%. We will make sure that index levels and related information are available to investors not just through our website but also through data vendors such as Bloomberg and Thomson Reuters, as well as services such as Google and Yahoo. The index is an excellent measure of the development and growth of a broad cross-section of Canadian small-cap public companies. PM: The CSE took part in the Prospectors and Developers Association of Canada (PDAC) convention at the beginning of March. Did you come away from this year’s event with any insights useful to issuers and investors? RC: I was impressed with the amount of positive energy this year. Going into the show I think a lot of people felt the mood was going to be fairly depressed, but it actually was quite the opposite. There was a lot of very positive energy and deals were getting done. We had a tremendous amount of traffic to our booth at the show. I came away with the sense that the Canadian mining community continues to be aware of the short-term challenges, both of low commodities prices and difficulty in raising additional funding to pursue projects. But these are strong and resourceful people we are talking about here, and most are optimists at heart. As a group, they seemed quite upbeat. PM: Large-cap stocks continue climbing to new all-time highs, and while things are improving for small caps, it can still be difficult for smaller companies to obtain financing under reasonable terms. That having been said, quite a few companies on the CSE have completed sizeable capital raises over the past 12 months. How are they accessing that capital? Who are the investors? RC: We don’t necessarily note who the investors are when a company completes its financing, although in working with companies we do become aware as to who some of the large backers are. It is my impression, and I have to say that this is more anecdotal than scientific, that it remains a mix that includes institutional investors who devote a portion of their portfolios to small-cap stocks, accepting higher risk in pursuit of higher returns. These are the ones who do their homework and work with good management teams and tend to support the right stories. We also see lots of high-net-worth investors and sometimes smaller retail investors. If you had asked me a year ago, the majority of the funding would have been raised with the assistance of the Exempt Market Dealer community. But this year we see more of the capital coming from the traditional dealer community. That is good because they are an important part of the ecosystem for small caps in Canada and the fact that we do seem to be running into these groups from the traditional dealer community more often is a positive indicator. PM: Some of the new listings on the CSE come from companies listed on a different exchange choosing to move to the CSE. Can you comment on this and do you see it continuing? RC: I think you can boil it down to superior service and cost-efficiency. And based on some of the conversations we had at the PDAC I would expect to see this continue. The other area that will increasingly become a focus for us is Canadian domiciled companies that did a public offering over the counter in the United States. Many companies in the life sciences and biotech sectors turned to the United States markets in the belief that there were not enough investors in Canada interested in that space for them to raise money. Well, now that the offering is complete you still wind up with a number of the officers and directors resident in Canada and they may not be satisfied with the levels of liquidity available to them over the counter in the United States. We would like to see some of those issuers join us and improve their secondary market liquidity. The other thing is to become part of a regulated market where there are continuous disclosure requirements and for these companies to build a disclosure record that can lower the cost of capital when they turn to capital markets in the future. We want to see some of the companies come back across the border, if you will. PM: The exchange space in Canada is as competitive as ever. With high-level changes at the TMX (new CEO and vision) along with the launch of Aequitas NEO Exchange, where does this leave CSE in the competitive landscape? RC: We are very comfortable with where we sit in the competitive landscape. The drive to deliver the lowest cost of public capital to Canadian reporting issuers is hard coded into the CSE’s DNA, and that advantage will always find an eager audience. Financing business growth via the public markets is one of Canada’s key strengths; the CSE’s growing market share of new listings is indicative of our importance in this space. The exchange will continue its efforts to improve the lot of issuers and dealers who service this market by delivering services designed to improve the liquidity profile of our issuers and address cost issues faced by our dealers. Aequitas was founded by a number of large dealers and buy side firms to address their particular problems. On the trading side, they are attempting to improve the ability of dealers and institutions to buy and sell large volumes of stock without undue market impact. On the listing side, they’ve clearly set their sights on the TSX’s franchise in exchange traded funds and structured products. The TMX Group has 4 equities trading facilities, an options and futures market, two clearing and settlement agencies, a transfer agent, an investor relations firm, an energy trading firm, a private company market, and, most recently, a live cattle trading facility. With our complete attention and focus devoted to the early stage community, we are confident that the CSE can continue to deliver a compelling service proposition.